In 1870, when Manitoba became a province, settlement could be measured within two miles of the banks of the Red and Assiniboine, save for a few outliers such as St. Laurent and Westbourne on Lake Manitoba, Ste. Anne on the Seine River, and Rat Creek near Portage la Prairie. From the confluence of the two main rivers continuous settlement went as far as Portage la Prairie on the west, as far as St. Peters on the north, and Ste. Agathe on the south. Much of this was Métis and could scarcely be called agricultural. Beyond was a migratory population of Indians who competed with the Métis in the buffalo hunt of the plains. In 1870, population of the "postage stamp" province of Manitoba was 12,888 excluding Indians. As a necessary preliminary to settling the empty lands, the rectangular survey system of townships and ranges was adopted in 1869 and the survey of the diminutive province was accomplished during 1871 to 1875. As in the United States, the township of thirty-six sections, each one mile square, was adopted making a uniform grid pattern from the Rio Grande to the Arctic. Nearly all the settled parts of the province were surveyed by 1890. In the ten-year period 1871-1881, the population of what is now southern Manitoba grew to 62,260. Because it had spread far beyond the 1870 provincial boundaries, these were enlarged in 1881 to include the southern part of the province as it exists today. The decade 1871-81 is not notable for the absolute increase in numbers of settlers (approximately 50,000), but for the fact that hundreds of square miles were claimed for agricultural settlement. The junction of the Red and Assiniboine Rivers became a point of organization and dispersal after 1870. From here and to a lesser extent at the boundary crossing point of Emerson, settlement left the river bank and took to the open prairie, to the forested hill slopes of Pembina Mountain, and to the "fertile belt" which lay along the southern flank of Riding Mountain. The array of circumstances and conditions that caused men to settle as they did were somewhat less complex in a pioneer society. The wants at this level were closely aligned to the basic necessities of food, clothing and shelter. But to some this was not enough. The gamble for easier ways and quicker gains made speculation a motive. Along with this were the customs and ways of differing cultural groups conditioned by the background from which they had sprung. Those who had farmed in peasant villages on the Russian steppe had no fear of the tall-grass prairie; those who looked to the sea as well as the land to provide a tenuous existence saw on the shores of Lake Winnipeg a chance to live a little closer to paradise and founded Gimli. And those who had come from the rougher lands and podsolic soils of Ontario could see in the land north of the Assiniboine and along the escarpment of Pembina Mountain the requisites of subsistence: wood, water and rich black soil. No one cared to drain the marshes that lay between the Assiniboine to the north and the Mennonite Reserve to the south. Such lands might have been a challenge to thrifty Netherlanders who were accustomed to reclaiming land through drainage as a preliminary step to cultivation. These were the lands, as A. S. Morton expresses it, with which the half-breeds were endowed. Equally spurned were the stretches of light sandy soil, and the dune lands of today's Spruce Woods Forest Reserve which remained unpeopled for thirty years after settlement began. Men spread around it; no one ventured very far into it. The Dominion Land Survey contributed also to the direction of settlement. As homesteads could be filed only on land already surveyed, settlement in general followed the survey. In 1872, the survey was carried west of the Red River, beyond the limits of Manitoba then defined, to the fourteenth range which runs north from Cartwright to Glenboro. The more adventuresome began to settle beyond the Pembina escarpment after 1875 and reached Crystal City and Rock Lake in 1878. Most of the land northwest of the tiny province was also surveyed in 1873, eight years before the boundary was extended to the west. This included the "park belt" between the Assiniboine and Riding Mountain as well as the land between Riding Mountain and Lake Manitoba, unattractive as it was. The policy of the government in surveying lands to the northwest strongly reflected the prevailing attitude that the lands most likely to be settled would follow the "willow prairie" of Palliser and Hind. On the other hand, the "true prairie", partly on account of its light soil and because it was timberless, would not be favourable for colonization. By 1880, most of the choice agricultural lands within the present boundaries of the province had experienced some measure of settlement with one exception, the southwest. The frontier by this date followed the Assiniboine to its junction with the Souris and then south along range 16 to Turtle Mountain. Here a fringe had already been formed along the edges of the mountain. The southwest up to 1880 was virtually empty. In 1879, possibly ninety settlers, mostly squatters, were camped on small claims awaiting the survey. The following year the number of land claimants was approximately one hundred and thirty-five. When the census was taken in 1881, the estimated number in the southwest was 1,900. By this time, the tide of settlement had commenced to roll westward. A decade later, no townships remained without homesteaders excepting six on undesirable tracts, and nearly all sections open to homestead entry had been taken up. By this time, the population had grown to an estimated 18,200. The purpose of the following analysis of settlement in southwest Manitoba arises from two questions. First, what forces were at work acting as controls in the settlement of the region? Second, what patterns of settlement took shape in response to these controls? Needless to say this was a decade of great change in all aspects of prairie settlement. Controls underlying and promoting settlement trends were themselves undergoing constant change. By no means least among them were changes in farming technique. The progress of settlement in its initial form was subject to three major controls: (1) the time of the survey, (2) quality of the land, (3) accessibility and technological changes. Minor controls were: land speculation and the advice of land agents together with other sources of information. Because unsurveyed lands were not open for homestead or sale, the timing of the land survey acted as a control to settlement. As a rule those lands last to be surveyed were last to be settled. The squatter had no rights except by registering his land in advance of another claimant at the lands office. This alone secured his tenure to a homestead. Land Surveyor R. I. Jephson, reporting on township 2, range 27 at the mouth of Antler Creek near the present site of Melita, mentions finding five squatters "living in a tent awaiting the survey each intending to locate on a quarter section". J. G. Kirk, writing his field notes on the Wakopa district near Turtle Mountain, entered therein in detail the land improvements of Bernerd La Riviere, who preceded the survey by several years. His entry concluded with the statement: "The fact of Mr. La Riviere raising such fine crops and showing and speaking of them to intending settlers is, I consider, a great benefit to this section of the country and I would recommend him to the most favorable consideration of the government on this account." It was required of the surveyors that all improvements be reported including the size of buildings, the amount of land ploughed and the value of improvements. This formed the basis for the Lands Office's dealing with the claims of squatters. But this was attended by an element of risk to the squatter as illustrated by the case of James Wiggins who, in the fall of 1879, a year in advance of the survey, camped at the point where the town of Souris now stands. There he erected a shack of oak logs, "but owing to the land not being sub-divided (he) could not get entry to the land". Meantime, Captain Gilbert Wood and W. H. Sowden arrived. The former tore down the shack and built a bridge with the logs. When the surveyor arrived in the fall of 1880, there was no evidence of improvements and Mr. Wiggins lost his land. Meantime, W. H. Sowden filed a claim, declaring that there were no improvements on the land. Notwithstanding the risk to squatters, some ninety were reported by surveyors as already on the land in 1879, at least one year and, in some cases, several years ahead of the survey. Prior to that year, most had located on the flanks of Turtle Mountain. 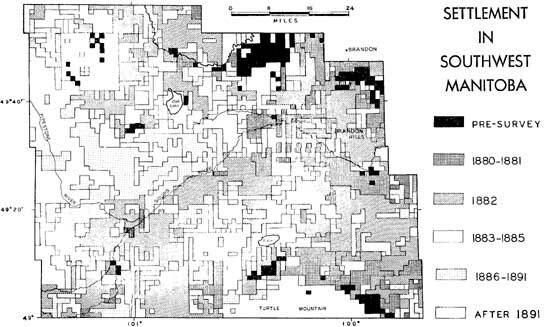 Doubtless this had provided reason to the government to survey in 1879, a year earlier than any other part of the southwest, two tiers of twelve townships in Turtle Mountain district. A second major control guiding the trend of settlement was the physical resources of the land defined in. its broadest sense. It was not so much the actual qualities of land that mattered as it was men's opinions of those qualities relative to agricultural settlement. But doubt still lingered in men's minds until Macoun, perhaps overly optimistic, sought to dispel for ever the myth of the "desert". In his "Physical Geography of Manitoba" he says of the Souris River: "Its course is through a level plain supposed formerly to be of no value but now considered the garden of the southwest. This was in 1881. He goes on to say: "On the Souris Plain, both east and west of Turtle Mountain, the early explorers found short grass and little water and called it a desert. Practical men break up the dry and apparently sandy soil and produce crops that astonish the world." Macoun was quoted as far as the continent of Europe and impressed the railway builders sufficiently that their main line was brought south of the Assiniboine in 1881, after it left Brandon. Dawson believed that the treeless prairie was the result of fires rather than deficiencies of rainfall, and that as man cultivated the soil fires would be stayed, trees would come back, and the climate would be appreciably changed for the better. The years 1878-79 were accompanied by larger than average amounts of rainfall which led to the opinion that the semi-arid prairie was moister than men had been led to believe. The rigorous prairie climate could not be denied, but optimistic settlers presumably saw the best in everything. Although it was undeniably cold, "Manitoba climate is superior, on account of its steadiness, dryness and purity of air, both in summer and winter ... The temperature should not be measured by the thermometer, but by the humidity ... the severest cold is less felt than even a milder cold in the damp atmosphere of the Eastern province, U.S.A. and England." By the time the survey entered the southwest in 1880, opinion about the region were as wildly optimistic as they had been stubbornly pessimistic. That the presence of wood for buildings and fences, and for fuel was of prime importance to the settler is reflected in the comments made by land surveyors and others in their reports. Emphasis on wooded land began to fade rapidly when it was fully realized that wheat land was the prime objective in the search for a homestead. Macoun made this clear when he said: "Wood and hay lands are really secondary objects, as it is much better for a farmer to have a good wheat farm which he can at once break up, and from which he can begin to make money, than to clear land of brush and young wood." Coal from the Souris Valley in Saskatchewan became readily available in the middle eighties and thereby reduced dependence on wood for fuel. Notwithstanding, in the early part of the decade, settlement did not stray far from sources of wood. Water for drinking purposes and for stock was also regarded as high in the list of priorities and had some effect in guiding settlement. The town of "old Deloraine" was located on a run-off channel leading from Turtle Mountain. The first homesteads were located along the banks of streams or in the proximity of springs. Failing this, it was important to have good water from wells, as opposed to "bad water", by which was usually meant water charged with alkali. Lands that betrayed the presence of alkali as shown by shallow ponds with encrustations around their margins were avoided; but the presence of clear ponds was regarded as favourable, especially if they afforded hay meadows around their margins. Closely associated with water was hay land. Ontario settlers were firm believers in having a few head of cattle, and certainly horses and oxen were indispensable. Most lands in the southwest had sufficient undrained depressions to produce, at least around their margins, a rank growth of native grasses. Surveyors were not slow to recognize such lands as having a place in the livestock industry. Comments such as "swamps furnish abundant forage for cattle" and "good deal of hay land along bottom flats of streams" and again in the vicinity of Brandon Hills, "fine rolling prairie with a fair quantity of good hayland", occur frequently in their notes. Attention was most certainly paid to the soil, but it seems frequently to have been subordinate to other considerations. J. F. Galbraith, a pioneer journalist who homesteaded in Pembina Mountain in 1874, in later years wrote: "in those days nobody ever looked at land - if the timber suited, the land had to." This was frequently the attitude in the early eighties in the southwest. Notwithstanding, the surveyors were required to rate the soil according to classes. This was done as they dug the holes for the marker posts. There is little evidence, however, of the criteria used to judge soil. A typical entry in the field books of the time would be "a fine, black rich sandy and gravelly loam", or "soil good pitch-black loam" or "dry and warm". Sometimes the depth would be given along with reference to the subsoil as "clay" or "yellow clay" or "a brownish marly-looking clay, porous and friable." It would appear that the surveyors frequently differed considerably among themselves in their opinion of soil classes. Sharp divisions occur along township lines. The eastern half of Turtle Mountain is rated third class while the surveyor on the western half regarded it as "class two". Nor is there any apparent agreement between their rating of soil and that of Manitoba soil survey of 1943. Soils rated by the latter as "loamy coarse sand" (class four) in the vicinity of Napinka are rated class one by the surveyor of 1880. This may be explained in part by the prevalent idea that light soils were easier to plough. A further example is provided in township 5 of range 27 near Brootnhill. The first surveyor in 1880 reported the soil as "black-loam", followed by a second surveyor who reported it as "second class, a poor sandy loam", while a third surveyor entered the note, "the soil is a dark rich sandy loam". And yet it would appear from the general direction of settlement that the homesteader used fairly good judgment. In general, the poorest lands were last to be taken up, although in detail there were many exceptions. The third major control that guided the lines of settlement was accessibility as afforded by the several means of transportation then in use. This included not only accessibility to land open to homestead settlement, but also to centres which would serve as supply points and shipping points for grain. The first farm settlers to enter the southwest came initially by two routes: the Boundary Commission Trail first established in 1873-74 by freighters from Emerson, and the Yellow Quill Trail from Portage la Prairie which wound southwest through the Sand Hills to the mouth of the Souris. The settlers that spread themselves around the base of Turtle Mountain as well as those who ventured into the upper Souris Valley used the Commission Trail, but those who first ventured to the slopes of the Brandon Hills used the Yellow Quill Trail. The Boundary Commission Trail was used extensively by incoming settlers from Emerson and Gretna. It was the route of earlier pioneers to the Pembina escarpment and beyond. A string of stopping places grew up separated by a day's journey. To avoid the mud of early spring, there were those who traversed the route in the dead of winter only to experience blizzards and extreme cold. By 1880, intending settlers were advised to arrive in late spring after the ruts dried up. Settlers' effects including, organs, pianos, mill machinery, lumber, even small houses, were teamed along the trail. Then came the more common and more regular shipments of hardware and foodstuffs, which were delivered to the storekeepers along the trail. The average freight load was between one and two tons. Settlers would have to make up to five trips to fetch all their effects from Emerson. Hundreds of settlers used the trail until 1886 when the railway reached Deloraine. Even from 1882, a large number came to the southwest from Brandon which had been reached by rail in 1881. To the north the Yellow Quill Trail as a means of entering the lands south of the Assiniboine was short lived. From 1876 to 1881, sternwheel boats operated on the Assiniboine from Winnipeg to Grand Valley and eventually to Fort Ellice. The coming of the railway to Brandon in 1881, and to the Saskatchewan border one year later, saw the end of steamboat traffic and the supremacy of the railway. Settlers in search of land arrived by the hundreds at Brandon and spread south. A branch line was built from Kemnay to Souris in 1886 and to Hartney in 1890. Meantime, the Deloraine extension to Melita was completed in 1891. The Glenboro extension reached Souris in 1892. Prior to 1885. when the railway reached Boissevain, wheat was teamed to Brandon from as far south as Turtle Mountain. Those in the southwest corner travelled over sixty miles to Virden to market grain. Brandon was non-existent until 1881, after which it quickly grew to a town of 4,000 and became the supply centre of the southwest until 1886. Then Deloraine captured much of the southern trade. But not for long. Each extension of the railway meant a new town and in rapid succession nearly all the towns in the southwest - Pierson, Tilston, Napinka, Hartney - had their beginning in the eighties. Technological changes in farm implements, making possible a more extensive use of the grasslands of the West, contributed to the speeding up of settlement during the eighties. The land agent at Brandon reported a heavy sale of agricultural implements in 1882. In order of value these were ploughs, two-horse wagons, self-binders, mowers and even steam threshers. As branch lines penetrated the south, fuel, building materials, hardware and implements could be had at any one of several towns. By 1885, a total of 4,644 sections had been surveyed in southwest Manitoba. Forty-one percent (1,912) were withheld from homestead entry, having been allocated as road, school or Hudson's Bay Company lards. The remainder were available for settlement under terms of the Homestead Act. The trend of settlement (Figure 1) is indicated by the dates when the first homesteads were taken up in each available section for the years 1880-85. Certain townships such as those south of the town of Souris, and those in which pre-survey squatting occurred, have no railway lands. In the case of the former, the government had already committed the lard to a Colonization Syndicate: whereas in the latter, squatters were give-,n title to the land. The railway's lack of interest in the sandy land south of Oak Lake is also apparent. By wad- of contrast, the railway showed an obvious interest in timber and coal on the west side of Turtle Mountain as indicated by the solid block of reserved land. Three major patterns emerge. First, by 1885, settlement had extended westward to Pipestone Creek in the northwest, and to the farther edge of the Souris Valley on the southwest. Here settlement halted. The lands in the triangle beyond were empty. Certain reasons may be advanced. Settlers along the northeast side of the triangle were attracted at an early date to the better lands of Pipestone Creek. Although the upland between the Creek and the Assiniboine was not very attractive for grain farming, the railway ran through the centre of it. Today, it has mostly stock farms, reflecting conditions which even then were recognized as less well-suited to grain farming. Farther to the west lay the Souris Valley, marked by a line of poor sandy to gravelly soils, which fingered into the uplands cutting them off from the Souris Plain. The uplands were unattractive, being broken by sloughs and run-off valleys thereby limiting their use mainly to stock farming. The second major element of the pattern is the very considerable movement during the years 1881-82. These were the years of the boom touched off by the railway reaching Brandon. 1882 shows more homesteads entered than any year before or since. The three years from 1883 to 1885 indicate a slowing down; partly by reason of the depression which brought an end to speculation, and partly by recurring frosts and dry years which discouraged prospective settlers. A third element of the pattern is two blocks of empty land: Turtle Mountain and the sand dune country of the lower Souris Plain. To this could be added the swamp lands in the vicinity of Oak and Whitewater Lakes. Unusually empty is township 4 range 24 which offered much good land. The pattern in general indicates a progressive movement southward from the pre-survey settlement of the Brandon Hills and Assiniboine River, to meet the northerly progression of settlers from the flanks of Turtle Mountain. Until 1886, settlement was largely contained by those lands lying east of the Souris River and its tributary, the Pipestone. Settlement in the last half of the eighties did much to fill in the empty lands to the west of these rivers. This broad, western triangle with its base along the Saskatchewan border witnessed a gradual influx to the end of the century. Much of this land is dissected by rivers flowing into the Souris, and much is pitted by pot-holes and poorly drained depressions which discouraged grain farming. The sandy lands south of Oak Lake were taken up earlier than those to the west. Only a few sections remained after 1891 without at least one quarter being pre-empted or sold. Thus it may be said that, insofar as rural settlement occurred, southwest Manitoba was completely settled by 1913. Thus was brought to a close the last of the great pioneer movements in Manitoba's prairie lands. The pioneer fringe now lay to the northeast where men were still pressing into the Swan River district and the less inviting bushlands that lay between the major lakes. 1. John Macoun, Manitoba and the Great Northwest (Guelph, 1882), p. 634. 2. H. Y. Hind, Narrative of the Canadian Red River Exploring Expedition of 1857, and of the Assiniboine and Saskatchewan Exploring Expedition of 1858, vol. 1, (London, 1860), p. 299. 4. G. M. Dawson, Geology and Resources of the Region in the Vicinity of the Forty-ninth Parallel, British North America Boundary Commission, 1875, p. 292. 5. Macoun, op cit., p. 47. 7. C.S.P., 1882, X(7), pp. 232-233. 8. Macoun, op. cit., p. 294. 9. Dawson. op. cit. p. 289. 10. Macoun, op. cit. p. 673. 12. C.S.P., 1882, XV (7), pp. 45-46. 13. James McArthur, Dominion Lands Survey Report, Number 22 (1880) concerning township 3, range 21W. 14. Evans and Bolger, Dominion Lands Survey Report (1881) concerning township 8 range 24W. 15. Jeff Gee, A Sketch of Both Sides of Manitoba (Nelsonville, 1881). 16. Report of the Select Standing Committee on Immigration and Colonization of the House of Commons, Appendix 3, 1885, p. 3. 17. L. O. Armstrong. "Southern Manitoba and Turtle Mountain Country" - 1880, p. 4.